The best anime movies offer everything the best live action movies provide, including believable characters, fascinating plots, captivating action, and emotional resonance. The use of animation allows for the creation of dazzling new realities and fantastic creatures, but it can also be used to create intimate worlds based on everyday life. Sample some of the best stories anime has to offer with these top movie selections. After their home is destroyed in a WWII bombing, two children must struggle to survive in the Japanese countryside. There are no fairytale happy endings here. Grave of the Fireflies is a highly rated movie that Meta Anime Review Project (MARP) praised as one of the best of the anime world. Film critic Roger Ebert called it "an emotional experience so powerful that it forces a rethinking of animation." When Chihiro and her family stop by a beautiful hillside while driving to their new home, they stumble upon a magical world of spirits. With her parents turned into pigs, Chihiro must find a way to return to her own home while helping others along the way. Director Hayao Miyazaki is a Japanese director who is frequently compared to Walt Disney for his widely-popular, family-friendly films. Spirited Away also earns high marks and praise from users of Anime News Network. It won the Oscar for Best Animated Feature Film in 2003. Princess Mononoke is another great film from Hayao Miyazaki. More violent than Miyazaki's other work, it tells the story of a cursed warrior who must seek out the spirits of the forest for a cure. However, once there, he finds himself involved in a larger struggle of man against nature. It's a mesmerizing tale that will keep viewers entertained until the very end. A tale of amazing psychic powers in a future dystopia, Akira is arguably one of the best anime films ever made. Its animation was impressive for the time of its release, and while not as flashy as the best digital animation, it still holds up today. It is arguably one of the most famous of anime movies, a title nearly everyone familiar with Japanese animation has at least heard of, if not seen. Mima is a top pop idol but when she leaves her singing career behind to pursue acting, things don't go quite as planned. As stress builds, Mima is plagued by disturbing hallucinations that begin to blend with real life. A twisting psychological thriller, Perfect Blue has electrifying elements that make anime so much fun. The Animatrix represents a unique marriage of Japanese animation and Hollywood styling. The movie is actually a collection of nine short films based on The Matrix and directed by some of the leading names in anime. Each director brings his own vision and artistic style to the piece while fleshing out the mythos of this complex world. The master thief Lupin III is in the midst of planning another big heist when he becomes entangled in the plight of a lovely young woman imprisoned in a castle. The Lupin III franchise is a behemoth in Japan, with three television series and yearly movie specials, and the title character is a cultural icon. The movie is also an early directorial project of Hayao Miyazaki. The combination of these two famous names creates a compelling and action-filled story, one of the best anime movies available. Castle of Cagliostro holds a special place in the hearts of anime fans, and rightly so. Two sisters discover the Totoros, furry magical creatures of all sizes who lead them on incredible adventures. A whimsical movie from director Hayao Miyazaki, My Neighbor Totoro is a wild, adventurous ride. Three homeless men stumble across an abandoned baby, and try to find its mother in the hopes of changing her mind. While this may sound like a depressing tale, director Satoshi Kon proves himself as adept at creating a charming dramatic story as he was at creating a sense of fear in Perfect Blue. Tokyo Godfathers has an addictive plot that will keep you guessing. Keiichi is a fairly average college student, except for the fact that he has his own Goddess named Belldandy. However, their happy life of love is disturbed when an old friend arrives and erases Belldandy's memory. Ah! My Goddess: The Movie will best be enjoyed by those familiar with the manga or anime series, but its plot easily allows new viewers to enter the world of Keiichi and Belldandy. This anime innovator made enough of an impact to inspire the makers of The Matrix film series, the Wachowski brothers. With elements taken from film classic Blade Runner and anime classic Akira, the film packs a healthy dose of action, suspense and a kicking soundtrack into its narrative. This anime film successfully combines fantasy, romantic and comedic elements with flair and ease. The result is a film that draws adult viewers in just as much as kids. With an all-star cast, featuring the voice of Christian Bale in the English version, Howl's Moving Castle is beautifully shot and full of vibrant colors, casting an enchanting tale of witches and wizards. Created in 1984, Nausicaa of the Valley of the Wind has proven that it has true staying power. With a storyline pitting humans against insects, exciting action sequences, a talented cast, and vivid animation, the film continues to impress audiences decades after its original release. 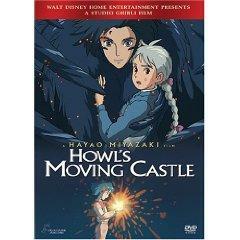 A great anime family film that interweaves action, adventure and fantasy with fulfilling results. Kids will be drawn to its lead characters as they attempt to thwart secret agents and pirates, while adults will be equally pulled into the suspense as the film unfolds. You can't go wrong with an anime feature film that has magic, princesses, romance and tons of adventure. That's exactly what audiences can expect when they check out anime favorite Ponyo, which is consistenly praised by critics and movie lovers. The film also contains some high-profile voice talent by the likes of Cate Blanchett, Matt Damon and Liam Neeson in the English version.